A dog who went missing for two weeks has been found stuck under the bonnet of his owner's car. 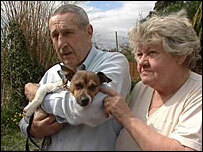 Duke the Jack Russell vanished from his owners' garden in Kidderminster, they thought he had been dognapped. Tom Whitney said he drove about 500 miles trying to find him but he was actually with him the whole time. It is thought he had been under the bonnet for a week and to keep going had eaten the clutch cable. Apart from being hungry and thirsty he was fine. Mr Whitney said: "I went all around Kidderminster I was out every day in this car going round, same streets any streets and if anybody said anything about a dog I was there." But on Monday when he tried to move the car the clutch would not work. "As I lifted the bonnet up so the little dog came up onto the engine just like the Phoenix coming out of the fire," he said.